"Nova Anglia, Terra Nova" (which means "New England, New Land" for folks who aren't fluent in Latin) is a journey from places well-known to those new and not-so-well-known; a harmonic and melodic journey to engage our senses of old and new, strange and familiar. 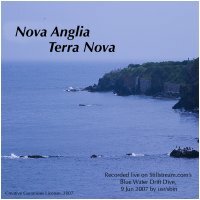 This piece was recorded live on June 9, 2007, as a live net radio performance on StillStream.com's "Blue Water Drift Dive" program. During the concert, the artist (Dennis Moser) used a Godin xtSA guitar, a Roland GR-1 guitar synthesizer driving software synths in Apple's Garage Band, an Ebow, a cluster of three Lexicon Vortex audio morphing processors, a Lexicon MX200, and a pair of Boss DD-20 GigaDelay pedals to produce this single take performance. This music with its strong didgeridoo undertones reaches out and reverberates my inner fibre, gentle and soothing I reach my iced zone with ease. The new land could probably be Australia.